One-of-a-Kind Contemporary Kitchen | Le Gourmet Kitchen Ltd. The eclectic touches in this contemporary kitchen design in Newport Beach are a testament to the personality and style of the homeowner. This one-of-a-kind kitchen remodel created a space that is both modern and timeless in its appeal. The kitchen design for this home located in Balboa Island in Newport Beach, transformed the space with customized details and a unique style. The custom Le Gourmet flat panel kitchen cabinets in a light wood finish offer ample storage and maximize the available space, while keeping the design bright and airy. An angled pantry cabinet was installed to allow for banquette seating. This includes a brightly colored seating area that complements the colorful island bar stools, and an angled table that fits the space perfectly. At the heart of this kitchen is the unique kitchen island with a custom stainless-steel table base that is the perfect spot for entertaining guests while cooking. 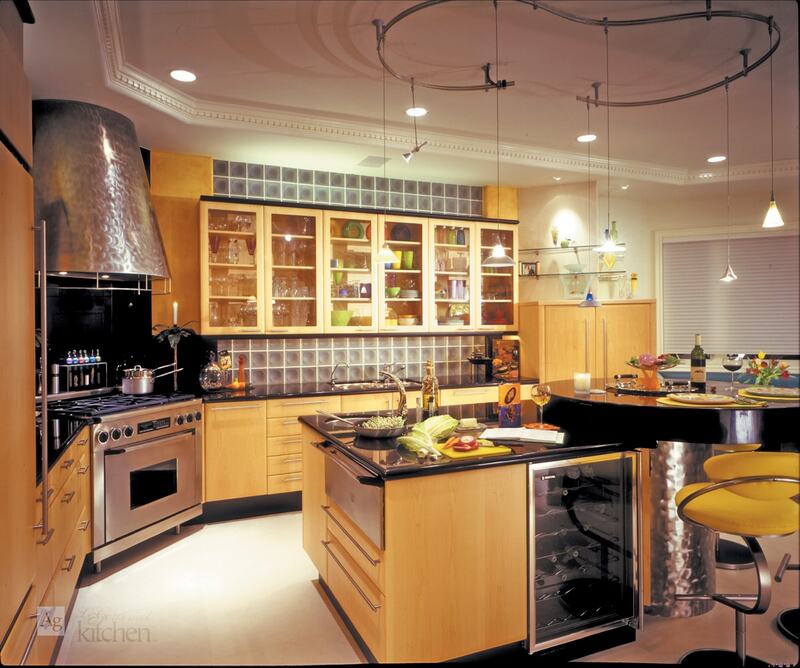 This is accented by a matching custom stainless-steel hood that frames the cooking area and brightens up the space. The kitchen features a Décor range and microwave, as well as a paneled Sub-Zero refrigerator. 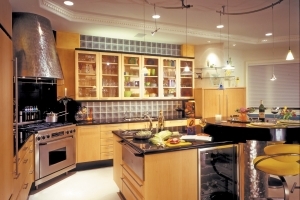 Glass features throughout the kitchen design, which serves to further brighten the room. Glass front upper cabinets and glass wall shelves give the room a more open, airy feel, while offering storage and a display area for special dishes and glassware. A glass block wall sits behind the upper cabinets, allowing light to flow through the space and giving the room a more modern edge. 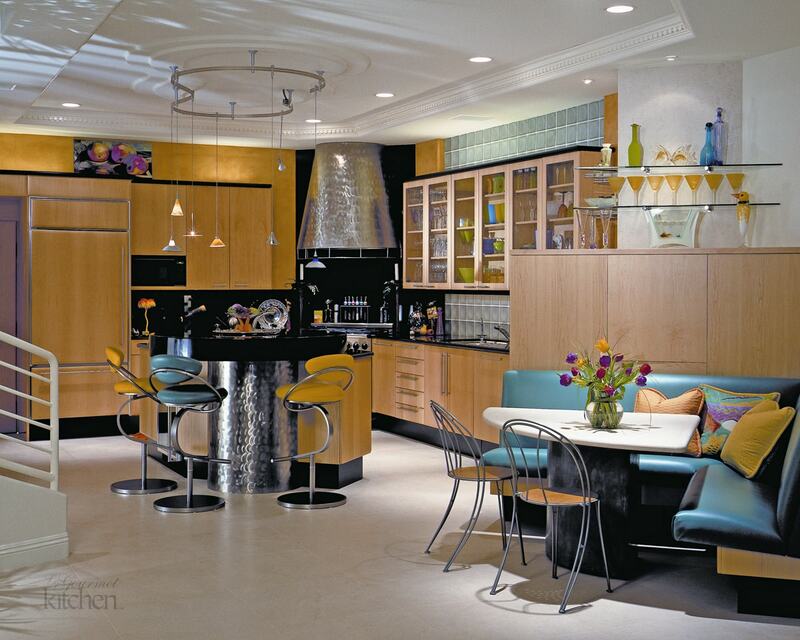 From top to bottom this kitchen design is an eclectic, modern space, that is still comfortable and inviting. The limestone floor is a bright addition to the room. Monorail lighting over the island is a unique feature offering a stylish touch and a practical addition to illuminate key work spaces. Every detail of this kitchen design was coordinated to create a one-of-a-kind room at the center of this home.